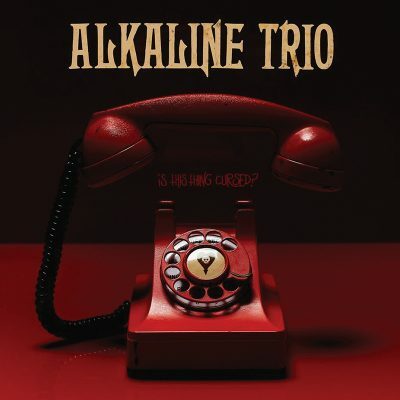 Review: Alkaline Trio – Is This Thing Cursed? It feels as if Alkaline Trio are sending longtime fans reminders of why they love them. The first track, “Is This Thing Cursed?” starts off sweet and welcoming, then progresses into everything you’d expect from an innovative, modern-day punk band: punk-beats in a 1980s vein, crashing symbols with interesting, hypnotic riffs, a sturdy bassline and, of course, Matt Skiba’s dark vocals. “Little Help” is probably the most fun and humorous track on the album. It’s the one song that isn’t super poetic or very emotional, but it’s high energy, entertaining and the embodiment of a punk boy matured. Hell, it’s even admitted in the lyrics: “Can anybody here buy this old fool a drink?” and, “Can anybody here give this old fool a lift?” While it may be a funny, filler piece for Is This Thing Cursed?, the boyish charm embedded into this track gives it that lovable trait. While there may be some points that lose my attention—specifically: “Sweet Vampires,” “Pale Blue Ribbon” and “Heart Attacks”—there are a ton of other songs that stand out from the rest. “Goodbye Fire Island,” is filled to the brim with poetic lyrics, scenic descriptions and reminds me a lot of The Lawrence Arms in their Cocktails and Dreams era. It’s easy to listen to, beautiful and offers enough room for the lyrics to shine through the instrumentals. They chose a perfect song to close out the album: “Kristilline.” It’s one of my favorites of the bunch because the toned-down acoustic guitar and vocals that open the track contrast rampantness of the rest of the album. It’s more relaxed sonically, but while it may be dressed-down, the passion continues to swell up to the chorus when Skiba shouts, “I want you, Kristilline.” His voice expresses desperation and longing—a perfect pairing to the airiness of this track. It’s a straightforward song that isn’t complex as far as construction goes, but it’s simple enough to sing along to, and the emotional heaviness of the track lingers long after the lyrics finish, into the outro.